Roman Epley of Swanton belts one to left field in the season opener March 23 against Northwood. Last Monday, Epley picked up the win on the mound in the Bulldogs’ 10-0 win over Evergreen. He also drove in a pair of runs. 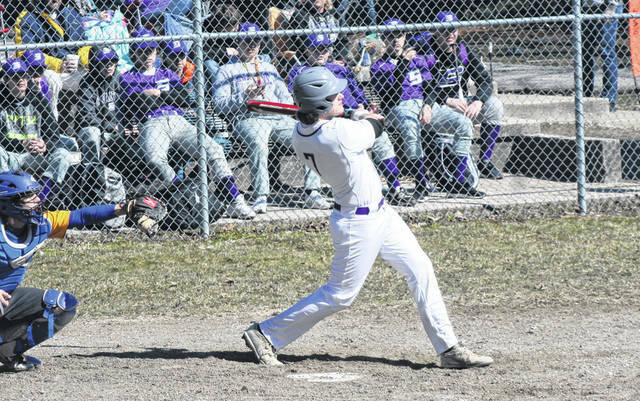 Swanton baseball picked up a pair of wins last week which brought their record to 3-0 on the season. The Bulldogs first hosted Evergreen last Monday, downing their rivals to the north 10-0 in six innings. They followed that with a 6-5 win on the road at Start Tuesday. Against the Vikings, Roman Epley got the win on the mound for the Dogs. He went four innings, giving up just one hit and striking out seven. Billy Nowakowski pitched the final two innings. Nowakowski was also big at the plate, finishing 3 for 3 with three runs batted in. Epley and Hunter Mix each had a pair of RBIs. Jayde Kruzel picked up the win in relief versus the Spartans. Nowakowski was 2 for 4 with a pair of RBIs, including the game winner. Michael Lawniczak added two hits and Derek Floyd notched a two-run double. Swanton once again has a big slate this week. After hosting Eastwood Monday they welcome Waite Tuesday, travel to Delta Thursday in the non-league and North Central on Saturday. Evergreen rebounded from last Monday’s loss at Swanton with a 15-5 home win over Delta a day later. Down 5-1 in the top of the second to the Panthers, Evergreen’s Collin Loeffler strolled to the mound in relief of Viking starter Tom Pollard, looking to give his team a few good innings. All the senior righty did was toss five innings of one-hit relief, and the Vikes used two big innings offensively to come from behind for the six-inning win. “Collin was not in the starting lineup,” Viking coach Brian Nagy said. “But instead of pouting and being a ‘me’ guy, he was a ‘we’ guy, and when he got the call he really went out and did the job. Hunter Hamilton got the Panthers going right away in the top of the first with a leadoff single off Pollard. Two walks and a wild pitch gave the Panthers a quick 1-0 lead. Mason Henricks’ leadoff double off Hamilton was followed by back-to-back Panther errors to draw the Vikings even, but Delta put a four spot on the board in the second. Jayce Helminiak’s bunt single was sandwiched with three more walks, regaining a Delta lead and spelling the end of the day for Pollard. Loeffler walked the first hitter he faced to force in another run, and a Viking error plated another. However, Loeffler went into shutdown mode after that. A fly ball from Austin Michael scored the fourth Delta tally of the inning, and Evergreen turned a 4-6-3 double play to get out without further damage. Evergreen got one back in the second on a walk, RJ Shunck’s single and Landon Vance’s fly ball to chop the lead to 5-2. The Vikes then took the lead for good the next inning. With one down, Jack Krispin, Sam Lubinski and Brock Hudik each singled to slice the Delta lead to 5-3. Shunck followed with a line drive single to left center to score a pair to knot the game at 5-5, then Vance executed a perfect suicide squeeze to put the Vikings ahead. Peyton Boucher’s single marked the fifth Viking run of the third to make it 7-5. Lubinski’s RBI single against Michael who came to the mound in relief, made it 8-5 in the fourth. Meanwhile Loeffler was breezing, allowing just Hamilton’s single in the fourth and striking out the side in the fifth. Evergreen then finished the game with a seven-run sixth. After Krispin walked, Lubinski followed with a double to left, and after Hudik drew a base on balls, Bryce Eisel took a pitch in the hip to score one run. Shunck tallied his third hit of the day, a double over the right fielder’s head to chase home two more runs. A Delta error, Henricks’ second double of the game and a wild pitch brought home the final three in the inning, thus ending the game. Loeffler went five innings, striking out six and walking just two for the win. Shunck and Henricks each had three hits to pace the Vikes who registered 13 hits as a team. Shunck also drove in four runs. Despite a stellar outing from Bryce Hudik, Evergreen fell 2-0 at home to Whitmer Thursday. The senior gave up just five hits and one earned run over seven innings. Evergreen (1-3) plays Liberty Center at home Tuesday in a non-league contest.